Gateshead Millennium Bridge is an architectural gift to the cities of Gateshead and Newcastle. Built across River Tyne, this is the first opening bridge of Gateshead that attracted worldwide attention for its unique design. The elegant bridge provides a footpath and cycle-way linking new arts and cultural developments at Gateshead Quays on the south bank with Newcastle Quayside. These arts and cultural centres include Baltic, The Centre for Contemporary Art - the biggest temporary art space in Europe and the Sage -a pioneering international centre for musical discovery. 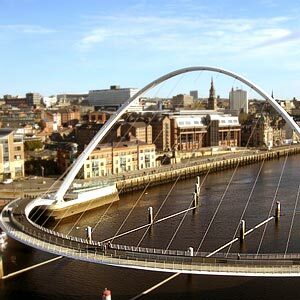 The Gateshead Millennium Bridge is a tilting bridge built in a completely original and elegant design. It uses the world's first tilting mechanism to open, turning on pivots on both sides of the river to form a spectacular gateway arch. Designed by Wilkinson Eyre Architects and engineers Gifford and Partners, the bridge's opening resembles the opening and closing of a giant eyelid. To raise the bridge, the whole assemble rotates as a single, rigid structure. As the arch tilts lower, the pathway rises, each counterbalancing the other so that a minimum of energy is needed. The geometry of the curves at each stage of the bridge's move is simply superb and elegant. This magnificent bridge connecting two cities had won the Royal Institute of British Architects' Stirling Prize in 2002. Though the posts and rods in the river that balances the bridge remains a quibble, it does not affect the aesthetic design of the structure. The opening of the bridge is a great scene and is witnessed by thousands of people. The bridge opens at pre-announced times as well in response to some shipping needs at other times. The Gateshead millennium Bridge is a bridge that has been constructed for cyclists across the river so that the two cross country riverside cycle ways are connected.